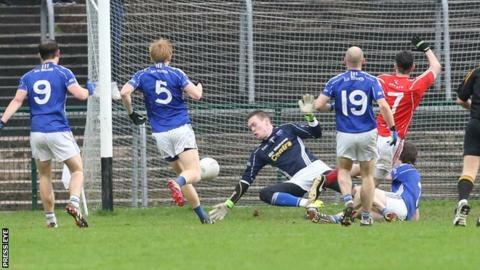 Scotstown set up an Ulster club decider against Crossmaglen by prevailing against Trillick in a tight semi-final. Daniel McDonnell netted early for Trillick but a Darren Hughes goal helped Scotstown to a 1-5 to 1-4 lead at the break in Brewster Park. Hughes completed his double before Niall Gormley fired in as Trillick closed to within a point. Points from Orin Heaphy and Rory Beggan ensured the Monaghan men reached a first provincial final since 1989. Farney forward Hughes was the star performer for Scotstown, adding two points to his goals. Trillick, who had All Star Mattie Donnelly in their ranks, were punished for squandering a series of openings in the second half. Scotstown will take on Crossmaglen, who beat Kilcoo by four points in Newry, on 29 November with the venue yet to be confirmed. Scotstown joint-manager Mattie McGleenan said: "It was an unbelievable game of football in very difficult conditions. "There was a 10-minute window at the end and it was a case of who would blink first - Rory Beggan stepped up with the decisive score. "There were two teams fighting and scraping for our every and the lads were outstanding, I'm so proud of them. "Crossmaglen are a superb team but our attitude is fabulous and we'll just give it our best. "I'm not saying we'll beat Crossmaglen, just that we will give them a good game."